Facilitating further Green Pig genocide, Intel's AppUp store is scheduled to get the ever-popular throw-things-and-break-stuff game. To say that Angry Birds is popular is an understatement. The little physics-based game is on every mobile device imaginable, and soon will come to home consoles. It even made an appearance on the Mac. 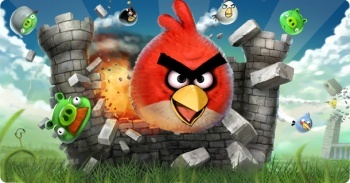 Now, Angry Birds is going to finish its inevitable conquering of every platform, ever. Angry Birds is finally coming to the PC. The game will be delivered as an App through Intel's AppUp store; an app store for the PC that Intel launched at last year's CES that functions in a similar manner to mobile app stores. Just download, install, and run. It'll be a lot like Steam just, y'know, with apps. Everything will update automatically, and will require as little effort by the end user as possible. Oddly, while the iPhone version of the game is only .99 cents to buy, the version on AppUp costs a full $5, and I'm not sure why. My guess? Greed.